Please feel free to print off the list below. Make copies and use it as you search the internet. My goal to to help you ferret out the puppy brokers, mills and dishonest people. 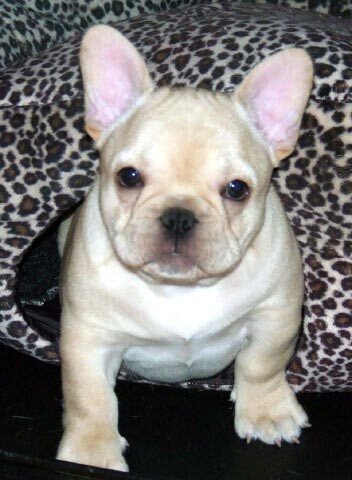 In your search of the internet for a frenchie you will undoubtedly find many websites that offer frenchie puppies for sale. Some of these websites will be representing wonderful breeders who are reputable and ethical. A reputable breeder will have the welfare of each of their puppies, and the breed in general, at heart. But for every reputable breeder you find on the worldwide web there will be literally hundreds that are not what they seem. How do you know if the website you have found is indeed a reputable breeder? What should you be looking for to alert you to the fact that they may be looking at a backyard breeder, puppy mill or puppy broker's website? Don't let a website's slick "presentation" fool you. Study the site and keep a pencil and paper handy along with the list below. Check off the "Red Flags" that you encounter as you look at the site. Doing this will help you determine if this is a breeder that will be someone you would like to know more about. Take your time. Remember, the time you take now will save you money and heartbreak later. 1. If they accept PayPal or credit cards.........RUN. 2. If they have several litters at one time........RUN. 3. If they have more than 2 or 3 breeds..........RUN. There are other signs of course. But these are a few of the real Red Flags that should alert you that you are at a site that is in the business of breeding dogs for a living, or that you are looking at a dog broker's site. Neither really care about the welfare of the puppy they are peddling, or about you. There is a wonderful site called The Wrong Puppy. This site is full of very valuable information that will help you steer clear of the people that are out there to scam you out of your money, or sell you a puppy that is ill. I highly recommend that you check that site carefully. I have listed it in the "Contacts" page of my website. A great place to begin your search for a new family member is at the Parent Club's website. It is chock full of fabulous information and is a "must read" for any prospective frenchie owner. This breed is NOT for everyone. They are a dwarf breed with many possible health issues, just as any breed has. The difference being that this fabulous breed can have debilitating health issues. Know what these health issues are and educate yourself well. Taking the time to educate yourself will pay you back tenfold. Be willing to be on a reputable breeders waiting list. You will be glad you did.